Since Binary Search can be easily implemented using Recursion, sometimes they also test candidate by asking them to implement binary search without recursion, also known as an iterative binary search algorithm. In this article, we will write a Java program which will take input from the user, both array and the number to be searched and then perform a binary search to find that number in a given array. You'll not use the Collections.binarySearch() method instead we'll write our own because it's a programming exercise to test one's coding skill. 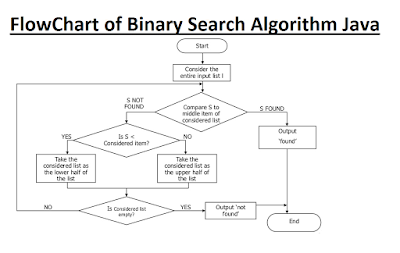 In order to implement a binary search, you must first know how binary search works? If you don't know the algorithm you cannot code it. So, let's first revise the binary search algorithm itself. Btw, If you are new into data structure and algorithm then I also suggest you join a comprehensive course like Data Structures and Algorithms: Deep Dive Using Java on Udemy, which will not only teach you the binary search algorithms but also other essential data structure and graph and hash-based algorithms. If you remember something about searching algorithms from your data structure and algorithms classes from your Computer Science degree college days you might know that binary search works on the principle of divide and conquer. In this technique, a solution is found by dividing the input on some smaller set using some rules. In a binary search algorithm, you first find the middle element of the array and compare that with the number you are searching. If it's equal then you return true or index of that number and your binary search is complete but if it doesn't match then you divide the array in two-part based upon whether the middle element is greater than or less than the key value, which you are searching. 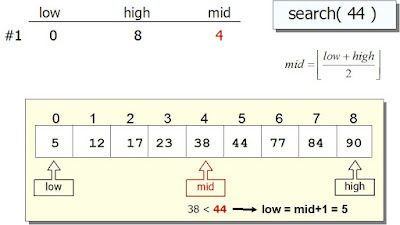 If the key(target value) is greater than the middle element than search values in the second half of the array because the array is sorted in increasing order. Similarly, if the key is lower than the middle element it means it's in the first part of the array. After each iteration, you rule out half of the array elements. Which means if you have 100 elements in the array then you need O(log2 100) i.e. 10 iterations to actually find the value or confirm that it doesn't exist in the array. If you are not sure about how to calculate time and space complexity of an algorithm, you should refer to a good data structure and algorithm course like Algorithms and Data Structures - Part 1 and 2 on Pluralsight. It's essential from the interview point of view to be able to find out time and space complexity of an algorithm. Several important data structures like binary search tree and binary heap are based upon the binary search algorithm, that's why it very important for a programmer or Computer Science graduate to understand and implement this algorithm by hand. Binary search is naturally a recursive algorithm because what you are doing is essentially a binary search at smaller input after each iteration, but in this program, you'll implement binary search without recursion. If you need more questions for practice for your coding interviews then you can also check out the Cracking the Coding Interview - 189 Questions and Solutions book, which contains more than 189 Coding problems and their solutions. Here is also a flowchart of the binary search algorithm, which will explain what I said more clearly, remember one picture is worth more than 1000 words. Here is our implementation of the popular binary search algorithm in Java. Though, you don't need to implement this algorithm if you want to use it in your production code. JDK collection API already has a binarySearch() method on the java.util.Arrays class. This implementation is for educational and for interview preparation purpose to teach students how to code binary search in Java. You can see that in our first array which is sorted 34 is successfully searched, but when I enter another number which is not in the array, you can see it successfully says that element is not in the array. That's all about how to implement binary search in Java without using recursion. This is an iterative solution of the binary search problem. The time complexity of binary search is in order of O(logN) if you get the sorted input. If you have to sort the input then you need to add that time on the total run time of the algorithm as well. Thanks for reading this article so far. If you like this Java Array tutorial then please share with your friends and colleagues. If you have any questions or feedback then please drop a comment. P. S. - If you are looking for some Free Algorithms courses to improve your understanding of Data Structure and Algorithms, then you should also check the Easy to Advanced Data Structures course on Udemy. It's authored by a Google Software Engineer and Algorithm expert and its completely free of cost. P. S. S. - If you have not read already then you should also read Introduction to Algorithms by Thomas H. Cormen to learn more about Algorithms and Data Structure.